Earlier this year, SANCCOB (the Southern African Foundation for the Conservation of Coastal Birds) released the story of Beakie, an African penguin that was hit by a speeding vehicle at Boulders Beach, Simon’s Town on African Penguin Awareness Day, 13 October 2012. Left with a severely damage beak, the brave little patient underwent two months’ of rehabilitation at SANCCOB and was eventually flown to Johannesburg to undergo reconstructive surgery at Onderstepoort Veterinary Faculty in Pretoria with the help of Dr. Gerhard Steenkamp. Since the successful operation in December last year, Beakie has been in the care of Dr. Adrian Tordiffe and Tracy Shaw at the National Zoological Gardens (NZG) in Pretoria. For the first few months, Beakie preferred to keep to himself and did not mingle much with the other 32 mischievous penguins in the zoo’s penguin colony. His favourite past-time was swimming in the pool and he quickly adapted to his injury, learning to take fish in just three weeks. 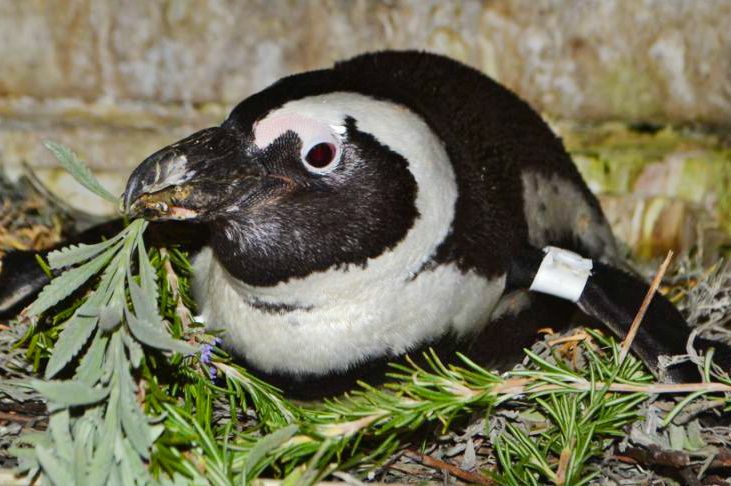 Recently, the zoo team noticed that Beakie befriended Treasure, a one-and-a-half-year old male who hatched at Bayworld Oceanarium in Port Elizabeth. The two soon became inseparable, cuddling up together and preening each other in their new nest. It warmed the hearts of the zoo keepers to see that the usually reserved Beakie finally found some companionship. In April, however, Beakie’s behaviour started changing. He was not swimming as much as he used to and spent most of his time lying in the nest. Extremely concerned, the local veterinarians were called to examine him. The morning before they arrived, the zoo team had a look in the nest to check on the patient. Much to their surprise, they found Beakie huddling over a freshly laid egg. It dawned on the team that Beakie was not in fact ill, but that he was in fact a she! The team presented some lavender and rosemary cuttings to Beakie and Treasure and soon the pair built a remarkable nest for their new egg. Soon afterwards, Beakie laid her second egg and the pair has been taking turns incubating the eggs and keeping their new home neat and tidy. Beakie now has a huge appetite and fights her way to the fish bucket on the days she is not nesting on her eggs. If the eggs are fertile, they are expected to hatch later this year. It has been quite a remarkable adventure for Beakie thus far considering all that she has been through – the trauma of being hit by a car, leaving her natal colony at Boulders, spending two months undergoing rehabilitation at SANCCOB, being flown by plane to Johannesburg, and then transported to Pretoria for an intensive operation, being introduced into a captive colony of penguins very far away from her home and finally meeting her partner Treasure, who has originally hatched in Port Elizabeth. Beakie’s story is a true testament of the resilience of the endangered African penguin and the subsequent success of Beakie’s operation expands our knowledge and the level of expert veterinary care we can offer birds during rehabilitation. You can visit the African Penguin Colony at Boulders Beach in Simon’s Town to view these quirky birds in the wild on a Cape Point Day Tour or by spending the night in Simon’s Town at one of the accommodation establishments. 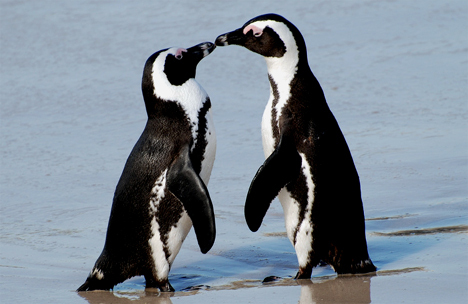 This entry was posted in Cause, Wildlife and tagged African Penguins, African Penguins at Boulders Beach, Boulders Beach, Penguin Colony Simon's town, Simon's Town Accommodation. Bookmark the permalink.